Bumblebee Jasper is formed from a sedimentary rock combination that contains sulfur, manganese oxide, realgar and orpiment (arsenic-sulfide minerals), and calcium carbonate. This makeup is different from most Jasper and so it is not a “true” Jasper and some say it is more of an Agate. Its known locations are only inside volcanoes located in Australia and Indonesia. Bumblebee Jasper is an excellent companion for the journey of life. It strongly stimulates the sacral and solar plexus chakras, freeing any blocked energies in these areas so that one may fully manifest the things they feel a calling to do. The energy flow here brings high levels of inspiration and intensity into one’s creative energy. This will inspire one to pursue new projects and increase one’s power of persistence to not give up despite any obstacles that may interfere. This is especially effective when one is pursuing something deeply meaningful to them. This stone noticeably increases the active neurons in the gut, which allows one to become more closely attuned to their instincts. When working with or carrying Bumblebee Jasper one can feel this as “buzzing” vibrations in the gut, which assist one in becoming more aware of opportunities. It attunes one to quickly spot golden opportunities, and assist in knowing the exact moment to execute action. 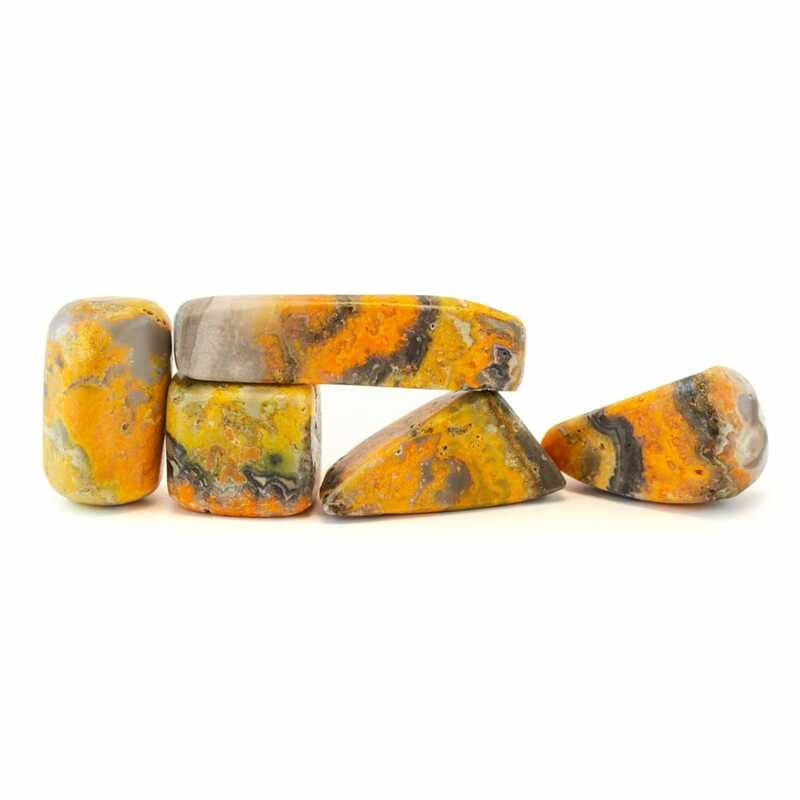 Bumblebee Jasper also enhances assertiveness, courage, endurance, and concentration. As a stone of adventure, it can spark inspiration to travel to new places, or even make new discoveries in familiar places. This stone will assist one in whatever type of adventure they embark on by helping with quick thinking, decision making, and inner knowing of where to go next. Bumblebee Jasper is highly recommended for those who are at a point of closing or ending certain parts of their life and beginning anew. This stone enables one to accept change, find new opportunities, increases self-esteem and aids in making decisions without relying solely on emotions. Its vibrations are of great assistance in finding the good in things coming to an end (although many of these things may seem bad on the surface). Situations such as losing a job, going through a breakup or divorce, or having to relocate can often discourage people, but the vibrations of Bumblebee Jasper are a powerful ally in quickly learning from these endings and creating new chapters in life. This is especially true for cases of unemployment as it inspires one to pursue a career they are truly passionate about, while providing the creative force to bring out one’s inner purpose. In any situation, this fusion of passion and purpose can lead to a major life shift and personal transformation. When meditating with Bumblebee Jasper one can feel its vibrations buzzing around the entire auric field, creating an intense yet comforting coat around one’s body. This can bring about feelings of encouragement and inspiration, leading one to new thoughts, ideas, and ambitions. Wearing it can provide a massive boost to mental clarity, quickness of thought, and powers of manifestation. These effects can be felt similarly to “butterflies” in the stomach, but provide more of a buzzing feeling similar to bees, which stirs one’s passion. Physically, Bumble Bee Jasper can help with abdominal issues, allergies, the nervous system, and heart/circulatory system disorders. It supports the intestines, liver, and kidneys as well.